If you haven’t already noticed, this summer I am all about the no-bake desserts. With limited time available and no desire to make the A/C work any harder than it already is, no-bake desserts are a perfect option. Not only are these cherry cheesecake bars an easy summertime treat but they are also a great addition to your 4th of July picnic or party. As with every dessert I make I try to make it as healthy as possible without the taste being noticeably off. These bars are no different. Instead of a traditional graham cracker crust made with fattening butter, this crust is made with olive oil containing heart healthy fats and omega-3 rich walnuts. The walnuts add a touch of extra flavor to the crust to make up for the loss of richness when butter is cut from the equation. To keep saturated fat in check in the filling, regular cream cheese is swapped out for a blend of reduced-fat cream cheese and nonfat Greek yogurt. You can even make these bars gluten-free if you make the simple exchange of gluten-free graham crackers for regular. Whether you want to pass a delicious dessert at an Independence Day themed picnic/party or simply desire an easy, no bake summer dessert for your family, these no-bake cherry cheesecake bars are sure to never disappoint! Process graham crackers in a food processor until finely ground. Add walnuts and pulse until finely chopped. Transfer to a bowl and stir in the sugar. Drizzle with the oil and stir to combine. Press into the bottom of a 13-x-9 inch baking dish. Beat cream cheese, yogurt, confectioners’ sugar and vanilla in a medium bowl with an electric mixer until smooth. Spread evenly over the crust. Spoon the cherry topping over the filling until no filling shows through the topping. Cover and refrigerate until cold and set, about 3 hours. Cut into squares and enjoy! Ζητω Η Ελλαδα!!! Χρονια πολλα Ελλαδα! Long live Greece and Happy Greek Independence Day to all the Greeks around the world! Today is a national holiday in Greece as it marks the start of the Greek war for Independence (March 25, 1821) from the Ottoman Empire (Turks). As a tribute to this important day in Greek history it is only natural I had to make one of if not the most famous Greek dessert around the world…baklava. As with everything I bake I try to put my own creative spin on it and these mini baklava bites are no exception. I know my version of baklava will probably drive all the yiayia’s (Greek for grandmother) crazy because it does not resemble anything to the traditional baklava they are used to making. However, I feel that given a taste of these bites even my harshest critics would find it hard to resist admitting how great these came out. Traditional baklava is a blend of toasted nuts (almonds, hazelnuts, pistachios, or walnuts depending on the baker) layered between buttery sheets of fillo then soaked in honey syrup. For my version, I decided to add a hint of chocolate because who doesn’t love chocolate. In order to incorporate the traditional flavor provided by ground hazelnuts, I used some leftover Greek Merenda spread, which is the Greek equivalent of Nutella, to provide a rich hazelnut chocolate flavor. For such a small dessert these bites do not lack any of the flavor or richness found in traditional recipes. They are great to serve at large gatherings because one recipe makes 30 and their bite size cuts down on the messiness of cutting into and eating the original. I recommend trying this modern version of the classic Greek dessert! Kali Orexi! Preheat oven to 350°. Arrange walnuts & almonds on a baking sheet and toast in the oven until golden & fragrant, about 5 to 8 minutes. Allow nuts to cool slightly. Meanwhile, add the honey, water, and cinnamon stick to a small saucepan set over medium heat. Stir until honey dissolves. Continue to cook, without stirring, until a candy thermometer reaches 230°, approximately 10 minutes. Remove from heat and keep warm. Discard cinnamon stick. Add the slightly cooled nuts to the bowl of a food processor along with the sugar, butter, cinnamon, vanilla, and salt. Pulse to combine. Place hazelnut-chocolate spread in a microwave-safe bowl and microwave on high for 30 seconds or until melted. Place mini fillo shells into wells of 2 mini cupcake tins. Working quickly place 1 tsp. of melted hazelnut spread into the bottom of each fillo shell. Next, top each fillo shell with 1 tsp. of the nut mixture. Bake in oven until filling is hot and fillo is golden, about 10 minutes. Pour 1 tsp. of honey syrup into each fillo cup while warm. Allow syrup to soak in and then add another 1 tsp. to each cup. Refrigerate at least 5 hours but preferably overnight for flavors to develop. Cheesecake is a delightful dessert rich in flavor and smooth on the palate. As much as I enjoy a slice of cheesecake I absolutely despise making it on my own. Cheesecake is up there on my list with Creme Brulee & Souffles when it comes to a severe inclination to avoid said recipes. It is not that I can’t make them it is just more tedious and I don’t enjoy making them like I do cakes and cookies. Baking is an outlet for me to reduce stress. Cheesecakes tend to create stress by wondering if the darn thing is going to crack despite doing everything correctly. There is only so many times you can get scalded by the hot water bath before you throw even cooking out the window. However, after taking a look at what I have prepared lately I was starting to see too much repetition. I decided I needed to venture out of my comfort zone and give myself a challenge like I had when in culinary school. The first item that came to my mind was the dreaded cheesecake. My favorite flavor of cheesecake is cherry and I have made it a thousand times. My love of cherry cheesecake in particular stems from my childhood when I would make the No-Bake Jello brand Cherry Cheesecake box mix. Although it was a heck of a lot easier cheesecake to make, it wasn’t necessarily a real cheesecake (probably why I enjoyed baking it growing up). Besides the taste the cherries lend cheesecake, I also love the appearance. The red is a great contrast to the light cheesecake base and makes for a stunning dessert every time. I wanted to replicate this stunning look but with something other than cherries. That is where cranberries come into play. I had some leftover cranberries frozen at their peak and needed to use them up so it seemed like a perfect fit. I made this for Valentine’s Day but it can be made for many other events such as anniversaries, Christmas, Independence Day, or even Go Red for Women parties which bring awareness to heart health. Although this is a skinnier recipe than traditional cheesecakes, I highly doubt the American Heart Association would define it as a heart healthy recipe. On average, cheesecakes similar to this one run about 575 calories and 22 grams of saturated fat while this cheesecake is 321 calories and 6 grams saturated fat (saving over 250 calories and 15 grams saturated fat per slice). Although I enjoyed this lightened up version of a traditional cheesecake I would make a few changes next time to appeal more to my own taste. I think I would prefer a regular graham cracker crust to the chocolate, despite my love of the stunning color contrasts the chocolate crust provides. If you follow the recipe as is you will witness how much a simple swirl of tart cranberries provides an elegant touch to rich filling encased in a chocolate graham crust. Enjoy! Preheat oven to 375°. Wrap outside and bottom of a 9-inch springform pan tightly with a double layer of heavy-duty foil (or place in a turkey size oven bag and seal at top). Grease pan lightly with nonstick cooking spray. Place crackers in a food processor and pulse until finely ground. Drizzle with oil and pulse until moistened. Press mixture into bottom and ½ inch up the sides of the prepared pan. Bake for 8 minutes. Remove from oven and cool on a rack. Reduce oven temperature to 325°. Place cranberries, sugar, liqueur, and water in a small saucepan. Bring to a boil. Cook 8 minutes or until cranberries have softened and mixture is syrupy. Cool for 20 minutes. Puree mixture until smooth with an immersion blender or pour contents into a food processor and pulse 1 minute. Combine 1 cup sugar and cream cheese in the bowl of a stand mixer or a large bowl. Beat with stand or hand mixer at medium speed until smooth. Beat in yogurt, vanilla, and salt. Add the whole eggs, 1 at a time, beating well after each addition. In a separate bowl, beat the 2 egg whites at high-speed until soft peaks form. Fold beaten egg whites into cream cheese mixture. Pour filling over crust. Spoon cranberry mixture over filling & swirl together using the tip of a knife. Place springform pan into a metal baking pan larger than the springform pan. Add hot water to the pan to create a depth of about 2 inches. Bake for 55 minutes or until the center of the cheesecake barely jiggles when pan is touched. Turn off oven. Cool cheesecake in closed oven for 30 minutes. Remove cheesecake from oven and run knife around the outside edge. Cool on a wire rack. Cover and chill in refrigerator for at least 8 hours. Stone fruits are one of summer’s best seasonal produce options. When I spotted some fresh Georgia Peaches on sale along with a red variety of plumcots, I had to bring them both home (plus a few plums that happened to hop on in). Unfortunately, these tasty gems go from remarkable to rotten extremely quick, like overnight quick. I probably should mention that it didn’t help matters that one of my cats decided to taste test one, bruising it pretty good. Of course once one peach gets bruised any near it also get bruised and soft. Upon first glance, the fruit looked like it deserved a trip to the trash. However, the great thing about stone fruits are they can easily be salvaged. Crisps are a simple, rustic way to save any stone fruits that seem past their prime. My golden rule is if the fruit still smells sweet and you don’t see any mold it can be thrown in a crisp. A crisp is a simple way to showcase the abundance of summer’s stone fruits. All you need is a small baking dish, the fruit, and a few other ingredients that are typical pantry staples. No extravagant shopping trips necessary. The stone fruits used in this crisp are peaches, plums, and plumcots. I specifically used black plums and red plumcots but you are welcome to use whatever combination you have on hand. I prefer this combination as it provides a mixture of tart and sweet fruits that complement one another. The goal is to add a hint of sweetness from the peaches but keep the flavor remaining tart overall so that it does not become too sweet when paired with the ice cream. The addition of cinnamon and nutmeg warms up the flavor of the stone fruits while the crispy oat topping provides a crunchy textural contrast to the soft fruit base. I find this crisp to be the perfect end to any summertime meal. This year it will be served at our Independence Day BBQ. It is best served warm with some low-fat vanilla ice cream or frozen yogurt. Enjoy & Happy 4th of July to America!!!!!!! If you are preparing the crisp ahead of time and would like to serve it warm to guests, you can place it in single serving bowls then microwave each bowl for approximately 30 seconds. If you would like to heat up the entire crisp at once you can place it in a 350° oven for approximately 5 minutes or until it reaches your desired degree of warmth. This crisp yields about 6 servings, however it can easily be doubled. When doubling the recipe make sure you use a 13 x 9 inch baking pan to accommodate the larger amount of ingredients. The nutritional information is based upon a serving that includes ½ cup of crisp and 1/3 cup low-fat vanilla ice cream. Combine all of the fruit base ingredients in a large bowl. Let mixture stand for 15 minutes. Preheat oven to 400°. Grease an 8 x 8 inch glass or ceramic baking dish with nonstick cooking spray. Spoon the fruit mixture evenly into the prepared pan. Bake for 25-30 minutes or until bubbly. Meanwhile, combine the oats, brown sugar, flour, cinnamon, and salt in a medium bowl. Drizzle mixture with the butter. Stir mixture with a fork until crumbly. Once the fruit base has finished baking, sprinkle the oat mixture over the baked fruit. Continue baking another 10 to 15 minutes or until the topping is lightly browned and the fruit is bubbly. Serve warm with low-fat ice cream or frozen yogurt. As Spring comes to a close and we turn things over to summer on June 20, now is the time to enjoy the bountiful fresh fruit options spring provides. Luckily, here in Central Florida, you can find white tents and loaded pickup trucks all over the sides of the roadways selling fresh, in season produce and other oddities (such as gator jerky) on a typical drive home year round. This time of year, the main produce being sold at these mini markets of sorts are strawberries. Since I live rather close to Plant City (Florida), the winter Strawberry capital of the world and host of the annual festival dedicated to strawberries, it is not hard to come by an abundance of strawberries at affordable prices. With an abundance of fresh, irresistible strawberries, finding new ways to use them is not only fun but tasty. Strawberries (and cherries) have always been my go to topping for cheesecake. As much as I love fruit glazed cheesecakes, I do have a problem with the cheesecake to fruit ratio often found in many recipes. The ratio ALWAYS leans heavily in the side of the cheesecake with minimal fresh fruit topping. I decided this needed to be changed. Why not make a cheesecake-esque dessert that focuses more on the fruit topping over the cheesecake filling. The following recipe is the result of such a desire I have had since childhood. With this recipe, for once, the strawberries are the star of the show. Instead of being a simple topping, the strawberries are nestled in a thinner layer of creamy cheesecake filling and graham cracker crust, allowing them to shine. Perhaps even better than the taste itself, is the fact that this dessert will not set you back a ton of calories. In fact the tart is very low in cholesterol and high in vitamin C. It is perfect to serve at spring and summer parties and your guests will never suspect it is not as indulgent as it appears. While on the topic of parties, this is also a great dessert that can be made in advance. You can easily make the crust and filling ahead of time (up to 2 days) and then assemble the dessert the day of the party. This will help free up some time to make all of the other items you may be serving that do not have the ability to be prepared in advance. This tart will easily serve 10 people. If you need it to serve more you can easily double (or triple) the recipe and divide the crust, filling, and topping evenly amongst two (or more) tart pans. You may have some extra strawberries if your cartons managed to miraculously not have any squishy or moldy strawberries at the bottom. Although I chose to use a 9 inch round tart pan, you may also use an 8 x 12 inch rectangular tart pan or 9 inch pie plate. Preheat oven to 350°. Lightly coat a 9 inch round removable-bottom tart pan with cooking spray. Set aside. Place the graham crackers in a food processor and pulse to fine crumbs. Add the sugar, butter, and water. Pulse until the mixture is moistened. Place the crumb mixture in the prepared tart pan and press into the bottom and up the sides of the pan.Bake for 10 minutes or until crust is lightly browned. Cool completely on a wire rack. Once crust has cooled completely, prepare the filling. In a medium bowl, combine cream cheese, sugar, vanilla, and almond extract. Stir until mixture is smooth. Use an offset spatula or the back of a spoon to spread the mixture evenly over the crust. To prepare the topping, place 1 cup of strawberries in a food processor and pulse until the mixture is pureed. In a small saucepan over medium heat combine strawberry puree, sugar, and cornstarch. Stir with a whisk until smooth. Bring mixture to a boil, stirring constantly. Reduce heat to low and cook for 1 minute. Remove the glaze from the heat and allow to cool to room temperature, stirring occasionally. Combine remaining strawberries (approximately 3 cups) and lemon juice; toss to coat. Arrange the strawberries, bottoms up, in a circular pattern over the filling. Spoon the glaze evenly over the berries. Sprinkle almonds around the edge. Cover and chill tart for at least 3 hours. Happy Independence Day to America!!! In all honesty this one kind of snuck up on me. I was planning to make an easy tutorial for 4th of July and I kept thinking in my head that I have more time and I shouldn’t start yet and then “boom” it is three days before and I haven’t even baked the cookies yet. Then when I do bake them my cookie monster toddler kept stealing them all off the table and instead of having 3 dozen I am left with 2. I want to scold her but seeing her nibbling cookie after cookie in the corner trying to hide from my sight is just too cute. I guess I will let her win this one and be a kid. Since I had procrastinated badly I thought I could squeeze in the quick decorating while the cookie monster was nibbling away without getting bothered too much. Boy was I wrong! The second she saw my frosting containers she knew its time to decorate and she wanted to make a mess…I mean help. Of course I made a spot for her at the table and let her hold the bottle as I piped the icing into the lines and dots I needed to make the cookie look like a firework explosion. Some came out great, others were a bit messy but that is perfect because not all fireworks are the same when they explode and this gave the cookies character. 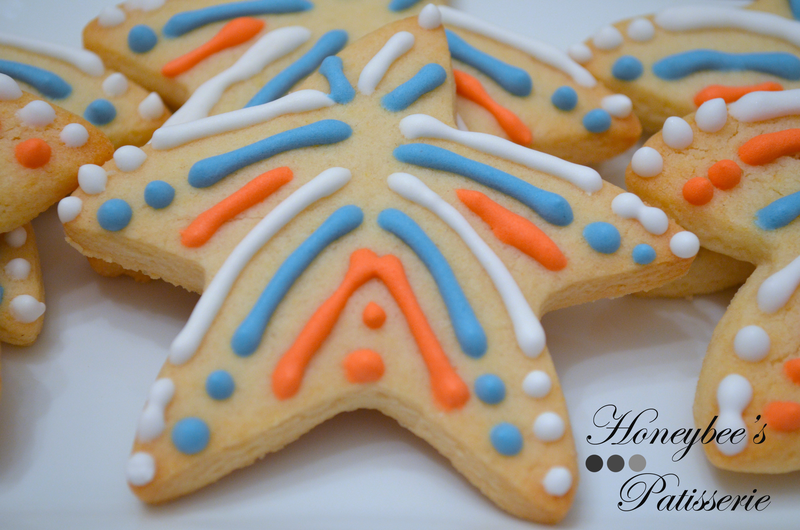 It also made me realize that these cookies should not just be marketed for adults that don’t want to spend too long decorating cookies but it is also a great way to spend time with your kids on the holiday making a patriotic treat. These are easy enough that adults won’t get stressed and kids can have fun making them with you. As I was sitting with my daughter watching the joy on her face as she squeezed a blob of frosting onto a cookie I was no longer frustrated that she wanted to help but rather I embraced the moment and didn’t want to finish the last cookie that seemed to creep up on us way too fast. Far too often I am in a rush to get things done thinking the faster I get it done the faster I can focus on my daughter but I end up missing out on opportunities to do just that. Luckily I didn’t miss this one and it meant a lot to me since I know this fall I will be returning to work and I won’t be able to spend all day with her. It has been weighing heavily on my mind lately as I have pretty much been a stay at home mom almost the entire time since she was born and I feel really guilty leaving her at home. I guess I will have to set up more mommy-daughter baking and decorating dates. What I like most about these cookies is they are completely customizable. They can be made with any color scheme and you can use any patterns you like that you feel represents what an exploding firework looks like. I used a sand dollar cookie cutter to give a unique shape that would help support the look of an explosion and falling particles but you can use any cutter you like. If you have a regular star you can use that or if you only have a circle you can also use that too. As far as colors go I used tulip red, white, and baby blue for Independence Day but you can pick any colors, especially if you want to recreate them for another holiday such as New Years you could do gold and black. 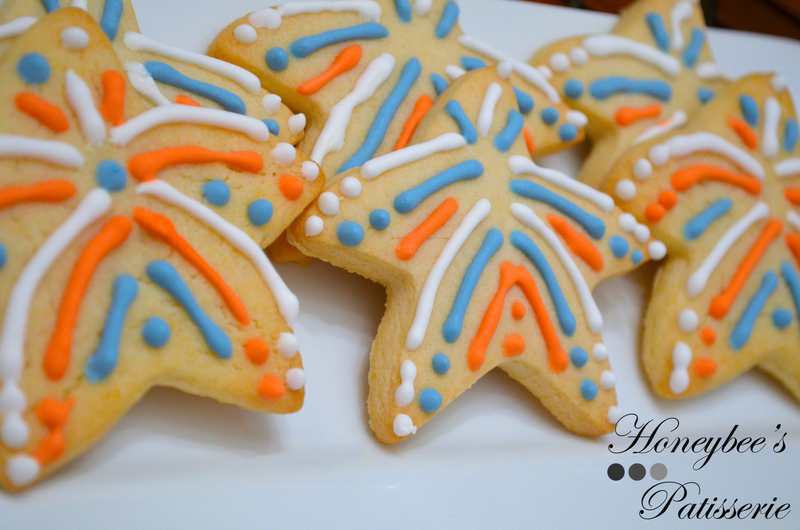 As always I use my favorite sugar cookie recipe and decorate with royal icing tinted with gel dye but you are welcome to use your own approach. The sky is the limit with these. They are designed to be easy and fun for all the family. 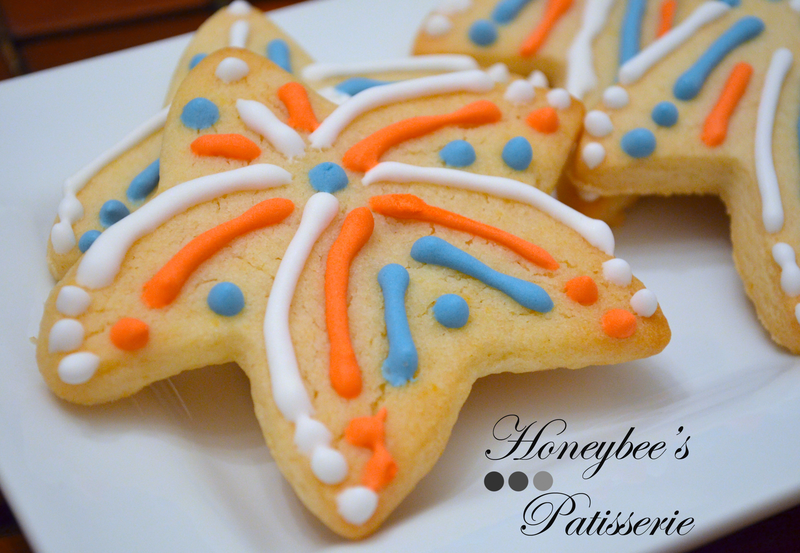 So go enjoy the holiday and celebrate your freedom if you are an American and if not just celebrate your family by spending time together making a batch of cookies and promoting your children’s creative expression.